As time-served tree surgeons for Stockport, Manchester and Cheshire we are well-versed in what to do with overgrown trees. The important thing is to ensure that we offer valuable tips and advice on what you should do when faced with an overgrown tree. This may have been a property that you have just moved into or may be a tree that has been in your possession for many years. Either way, they aren’t always problematic. You may just want to ensure that you are in a position to appropriately care for your tree, rather than remove it. Are the tree branches blocking light? Maybe the branches are blocking the view to your home? It may even be the case that your tree is overhanging a boundary into a neighbours garden. Know your rights: any land owner is responsible for vegetation grown on their land and can be held accountable for that growing onto roadsides. If this growth goes onto public land, you may receive requests from your local council to deal with the problem. You are also within your right to cut back any material that grows over onto your property boundary. By common law you must offer to return the cut material. However, if there is any ongoing damage to the tree or hedge, you can in some cases be responsible. Top tip: always check whether the tree that you are trimming is not under a tree preservation order. If it is, you will need consent from your local council to begin any work. Undertake regular work: it is far easier to keep on top of large trees. This is possible in most cases, but exceptionally large trees may require the assistance of professional tree surgeons. In the cases where you are able to maintain the tree, ensure to trim branches regularly. Use machinery safely and always take your time. Disposal of the cut material needs to be done in the appropriate manner. 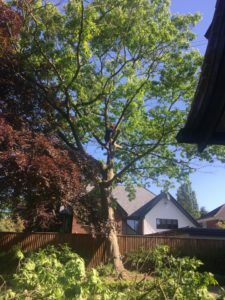 If you require the help of a time-served professional, we invite you to call Bostock Total Tree Services on 07855 859983.